Make a note in your diaries vintage lovers, the next instalment of the Primrose Hill vintage fashion fair is taking place next Sunday. The lovely Marilyn has been holding vintage fairs in Primrose Hill for two years now and is a fountain of knowledge about all things vintage, having owned her own vintage shop in Battersea and organising vintage fairs in Earls Court in 2006. 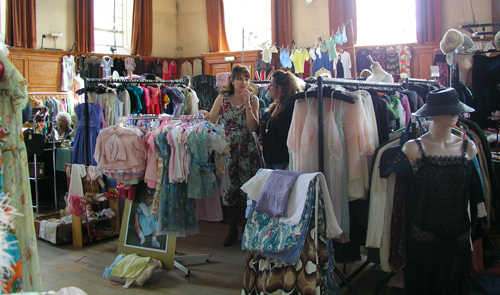 The next fair is being held next Sunday – 17th April- at Cecil sharp House in Primrose Hill. It’s a lovely excuse to get dressed up and there will be prizes for the most authentic, quirky or unusual vintage attire. At the 28 stands, there will be a huge selection of affordable vintage wares from a variety of decades as well as some really special designer pieces for the eagle-eyed visitors. Cecil Sharp House, 2 Regents Park Road, London NW1 7AY. Ah if only I lived in London but I even seem to miss the vintage fairs that happen in B'ham too! only in london in a week and a half! 🙁 hopefully u hv more tips then.. haha. i do love your photobooth pics, stay fab love! hope u r wellandrea xxxxLife In Technicolor.